1دانشجوی دکتری روان‌شناسی عمومی، گروه روان‌شناسی، پردیس علوم و تحقیقات خوزستان، واحد اهواز، دانشگاه آزاد اسلامی، اهواز، ایران. 3دانشیار، گروه روان‌شناسی، واحد اهواز، دانشگاه آزاد اسلامی، اهواز، ایران. مقدمه: درد قفسه سینه از جمله شکایت‌های رایج افراد در مراجعه به مراکز درمانی ‌است که پس از بررسی مشخص می‌گردد اغلب این دردها منشأ غیر قلبی دارند. درمان شناختی-رفتاری یک روش روان‌درمانی مبتنی بر دو دیدگاه رفتاری و شناختی است که در این روش تأکید روی اصلاح رفتار و تغییر آن است. لذا هدف پژوهش حاضر بررسی اثربخشی درمان شناختی-رفتاری بر انعطاف‌پذیری روان‌شناختی و نشخوار فکری بیماران با درد غیر قلبی قفسه سینه بود. مواد و روش­ها: این پژوهش از نوع کار آزمایی آموزشی تصادفی با پیش‌آزمون، پس‌آزمون و پیگیری با گروه کنترل بود. نمونه پژوهش40 بیمار بودند که به شکل هدفمند از بیماران مراجعه­کننده به بیمارستان مرکز قلب تهران در سال 1395 انتخاب گردیدند و به‌طور تصادفی در دو گروه آزمایش و کنترل قرار گرفتند. آزمودنی‌ها به دو پرسشنامه انعطاف‌پذیری روان‌شناختی و نشخوار فکری پاسخ دادند. گروه آزمایش تحت 8 جلسه 90 دقیقه­ای درمان به شکل هفتگی قرار گرفتند و جهت گروه کنترل به شکل هفتگی ویزیت رایگان انجام گردید. داده­ها با آزمون­های­ t مستقل، آنالیز واریانس دو طرفه با اندازه‌گیری­های مکرر و آزمون تعقیبی بونفرونی بررسی شدند. یافته­ ها: میانگین نمرات مقیاس نشخوار فکری کاهش و انعطاف‌پذیری روان‌شناختی در گروه آزمایش بر خلاف گروه کنترل افزایش یافت (001/0p<). این برتری در پیگیری دو ماه بعد نیز حفظ شده بود (001/0p<). نتیجه ­گیری: آموزش درمان شناختی-رفتاری بر انعطاف‌پذیری روان‌شناختی و نشخوار فکری جهت بیماران با درد غیر قلبی قفسه سینه که دچار ناتوانی‌های جسمی شده‌اند، مؤثر است و نتایج درمان نیز پایدار می‌باشد. 1PhD Student of Psychology, Dept of Psychology, Science and Research College of Khuzestan, Ahvaz Branch, Islamic Azad University, Ahvaz, Iran. 2Associate Prof, Dept of Psychology, Ahvaz Branch, Islamic Azad University, Ahvaz, Iran. 4Assistant Prof, Dept of Psychology, Ahvaz Branch, Islamic Azad University, Ahvaz, Iran. Introduction: Chest pain is from among the common complaints individuals make when referring to therapeutic centers, but often after examinations it becomes evident that the pain has a non-cardiac origin. The cognitive-behavioral therapy is a type of psychotherapy based on the two cognitive and behavioral perspectives, with an emphasis on correcting the behavior and changing it. Therefore, the current study was conducted aimed at investigating the effects of cognitive-behavioral therapy on psychological flexibility and rumination in patients with non-cardiac chest pains. Materials and Methods: This is a randomized educational trial study with a pretest and posttest design, and a follow-up with the control group after two months. The research sample was selected purposively, including patients having referred to Tehran Heart Hospital, comprised of 40 patients with non-cardiac chest pains who were then randomly divided into experimental and control groups. The subjects responded to the psychological flexibility and rumination questionnaires. The experimental group was subjected to eight 90-minute weekly sessions of cognitive-behavioral therapy and regarding the control group, weekly visits were conducted free of charge. The results were analyzed using the independent t-test, the two-way analysis of variance with repeated measurements, and the Bonfe rroni method, making use of software. Results: The results demonstrated that after performing 8 sessions of cognitive-behavioral therapy, the mean score of the rumination scale decreased and that of psychological flexibility increased in the treatment group, in contrast to the control group (p<0.001). Conclusion: Providing trainings in cognitive-behavioral therapy is effective in psychological flexibility and rumination in patients with non-cardiac chest pains with physical disabilities. Fass R, Navarro-Rodriguez T. Noncardiac chest pain. JCG 2008; 42(5): 636-46. Fass R, Achem SR. Noncardiac chest pain: epidemiology, natural course and pathogenesis. JNM 2011; 17(2): 110-23. Schroeder S, Achenbach S, Körber S, Nowy K, de Zwaan M, Martin A. Cognitive-perceptual factors in noncardiac chest pain and cardiac chest pain. Psychosomatic medicine 2012; 74(8): 861-8. 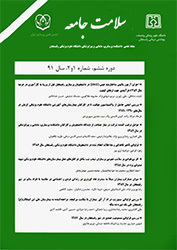 Beheshti AS, Irajian GH, Darabian M, Shafaian M, Ghorbani R, Keshavarzian M,etal. Determination of frequency and severity of mental and psychological disorders in patients with Non-cardiac chest pain referred to the Cardiology Clinic. JSUMS 2005; 7(1,2): 101-6. Castillo-Richmond A, Schneider RH, Alexander CN, Cook R, Myers H, Nidich S, et al. Effects of stress reduction on carotid atherosclerosis in hypertensive African Americans. Stroke 2000; 31(3): 568-73. Frasure-Smith N, Lespérance F. Reflections on depression as a cardiac risk factor. Psychosomatic medicine 2005; 67: S19-S25. Esler JL, Barlow DH, Woolard RH, Nicholson RA, Nash JM, Erogul MH. A brief cognitive-behavioral intervention for patients with noncardiac chest pain. Behavior Therapy 2003; 34(2): 129-48. Clarke S, Kingston J, James K, Bolderston H, Remington B. Acceptance and Commitment Therapy group for treatment-resistant participants: A randomized controlled trial. JCBS 2014; 3(3): 179-88. Chambless DL, Ollendick TH. Empirically supported psychological interventions: Controversies and evidence. Annual review of psychology 2001; 52(1): 685-716. Sadock BJ, Sadock VA. Kaplan and Sadock's synopsis of psychiatry: behavioral sciences/clinical psychiatry. 10 nd ed. Philadelphia USA: Lippincott Williams & Wilkins; 2007: 88-98. Nolen-Hoeksema S, Davis CG. " Thanks for sharing that": Ruminators and their social support networks. JPSP 1999; 77(4): 801-14. Masten AS.Resilience in individual development: Successful adaption despite risk and adversity. 2nd ed. NJ: Lawrence Erlbaum; 1994: 15-6. Dolan SL, Martin RA, Rohsenow DJ. Self-efficacy for cocaine abstinence: Pretreatment correlates and relationship to outcomes. Addictive behaviors 2008; 33(5): 675-88. Jonsbu E, Dammen T, Morken G, Moum T, Martinsen EW. Short-term cognitive behavioral therapy for non-cardiac chest pain and benign palpitations: a randomized controlled trial. JPR 2011; 70(2): 117-23. Bond FW, Hayes SC, Baer RA, Carpenter KM, Guenole N, Orcutt HK, et al. Preliminary psychometric properties of the Acceptance and Action Questionnaire–II: A revised measure of psychological inflexibility and experiential avoidance. Behavior therapy 2011; 42(4): 676-88. Nolen-Hoeksema S, Morrow J. A prospective study of depression and posttraumatic stress symptoms after a natural disaster: the 1989 Loma Prieta Earthquake. JPSP 1991; 61(1): 115-21. McCracken LM, Velleman SC. Psychological flexibility in adults with chronic pain: a study of acceptance, mindfulness, and values-based action in primary care. Pain 2010; 148(1): 141-7. Morone NE, Lynch CS, Greco CM, Tindle HA, Weiner DK. “I felt like a new person.” The effects of mindfulness meditation on older adults with chronic pain: qualitative narrative analysis of diary entries. The Journal of Pain 2008; 9(9): 841-8. Mourad G. Improving care for patients with non-cardiac chest pain- Description of psychological distress and costs, and evaluation of an Internet-delivered intervention. 1nd ed. Sweden: Linköping University Electronic Press; 2015: 37-43. Kolivand P, Nazarimahin A, Jafari R. The effect of eognitive-behavioral therapy on pain intensity in patients with chronic pain. ShKKJ 2015; 3(3): 70-5. Hofmann SG. An Introduction to Modern CBT: Psychological Solutions to Mental Health Problems. 1nd ed. New York: Wiley-Blackwell; 2012: 93-105. Carruthers P. Two systems for mindreading? Review of Philosophy and Psychology 2016; 7(1): 141-62. Hayek SS, Ko Y-A, Awad M, Soto ADM, Ahmed H, Patel K, et al. Depression and chest pain in patients with coronary artery disease. IJC 2017; 230: 420-6.